Van Nuys – O Hei There! Hard to mess this dish up, and they certainly didn’t here. Recommended by the waiter. I thought it was decent, but would’ve preferred another shrimp dish. My mom’s boyfriend noted that the beef slices were on the saltier side, which I agreed with. But the dish itself was pretty good. 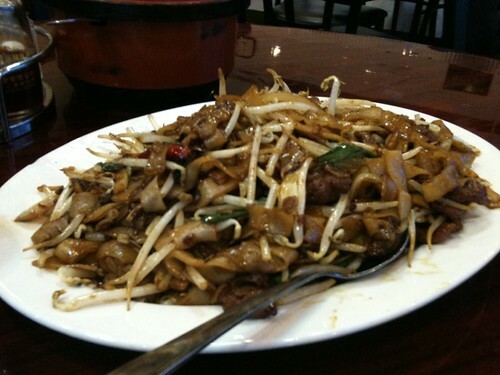 I’m a sucker for beef chow fun. Now this is what I’m talking about. 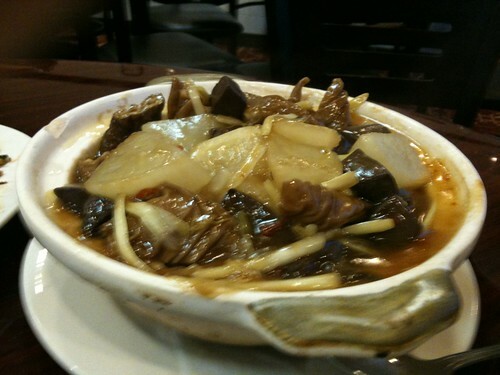 My favorite thing about Cantonese cuisine – the BBQ meats. 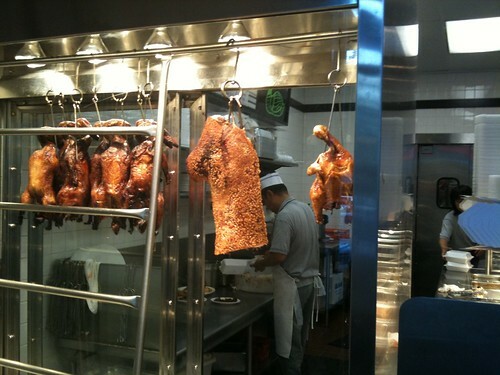 Roast duck = awesome. Soy sauce chicken = awesome. Suckling pig = …not as awesome. The skin was a little on the chewy side, as opposed to being crispy. But the pork itself was quite delicious. Pig’s intestines are by far my favorite offal. Being the Taiwanese that I am, I’m usually in favor of having them fried. But I have no problems with them served in a hot pot, assuming they’re cooked right. 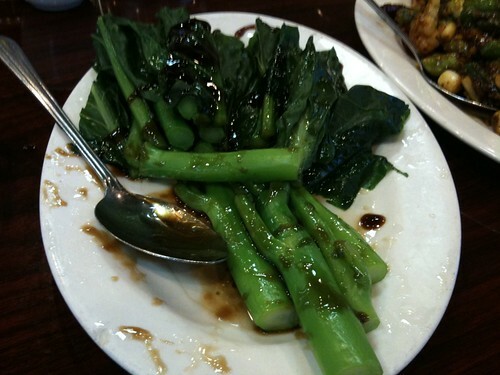 The intestines here were cooked quite well, and the pig’s blood and turnip accompanied them well. Lesson of the day: always listen to your mother (and her boyfriend). 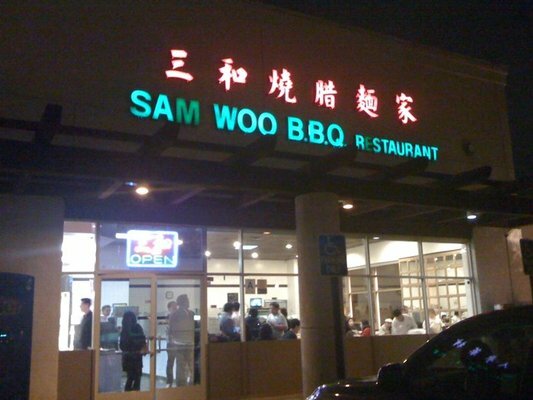 I was pleasantly surprised by the quality of the food served at this location of Sam Woo. And like I said at the beginning of this post, I believe that this location is my favorite of all the ones I’ve been too (and I think I’ve been to all but one or two of the locations in L.A. County). 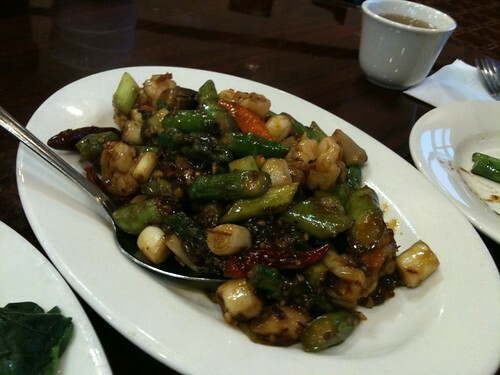 Just good, solid Cantonese food. I guess this is how Sam Woo has been successful for so long – often-imitated, never duplicated. I wonder if the other locations are currently this good (though to be honest, I’m not that curious to find out). If I’m feeling like having some Sam Woo, I’ll just drive up to the OTHER valley.